Modern design ideas for the home have begun to spring up at the turn of the 20th century. With modernization making its way in every element of society, it is not strange that even architectural principles have advanced in terms of technology and design. Modern homes now reflect a clean and simple look, eliminating unnecessary detail. This can be seen in the way architectural details are designed nowadays such as windows. Bay windows in modern homes have lost their traditional design of 3 windows with 2 same-sized ones on each side of a bigger middle window. They still maintain their original form of projecting from the main wall of the building that provides extra space inside the home. Modern bay windows are now more simplistic with visual emphasis on vertical and horizontal lines. The natural appearance of the materials used are clearly seen rather than altered. One of the features of bay windows is the added seating space it provides. Gives an excellent view of the outside. Allows plenty of natural lighting. Gives a unique character to your home’s exterior design. Bay windows are perfect architectural elements that can increase how a home functions and looks. 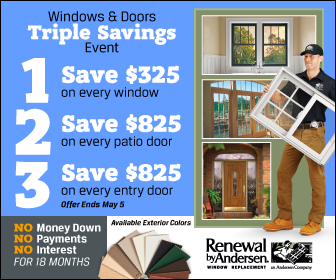 Renewal by Andersen® brings you window materials that cover all you need to achieve the perfect look for your windows. We are a Chesterfield, Missouri windows company that cares about your home. We only provide products made from the best designs and materials and we h andle the installation so you don’t have to. We got you covered from start to finish. Give us a call now to find out more about us!